60110 The Edilio Parodi Club Edition 2003. As mentioned elsewhere on this website, Edilio Parodi (the man and the company) was responsible for importing Subbuteo into Italy from the 1970s to the 1990s, and were therefore responsible for the popularity of the game in Italy. 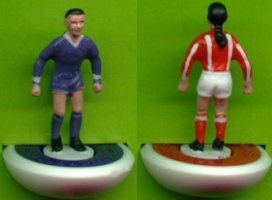 When they could no longer obtain new Subbuteo items, they produced a clone of the game - called Zëugo which used the classic hand painted look and figures from Subbuteo's 1970s heyday. 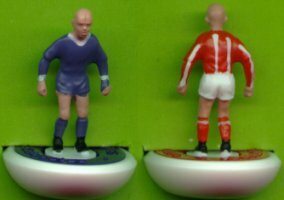 In 2002, Parodi obtained a licence from Hasbro to make new Subbuteo items for the Italian market. One of the first items to be produced under this agreement is a new box set. This new standard edition will hopefully be the foundation on which a successful new range is built. Although just a basic edition, this set has enough interesting features to make up my second "focus on" page. A big thank you here to Andrea Putignani who supplied the set that I've scanned, reviewed, and had so much fun with! This is obviously the first thing you are going to see when you walk into the shop, so luckily the box is rather stylish, and is produced in the one colour that never goes out of fashion - black. On the front is a picture of a giant Subbuteo ball, and a revamped logo that has been given a shiny new look, and includes a ball with an "S" logo poking out from behind the Subbuteo name bar. The picture of a football match on the front has clearly gone through a retouching program, so that it has become a general football image. i.e. no club logos are in evidence, and even the players have had their hair colours changed. As a nice nod to sets of yore (well maybe) the strikers seem to be wearing Watford shirts. The retouch has also included changing the advertising boards to Subbuteo ones - mentioning the game, Edilio Parodi and Italy. The front of the box also has the contents listed in little graphics - 2 goalkeepers, 22 players, 1 pitch, 2 goals, 2 balls. 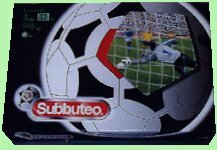 The sides of the box have the new version of the Subbuteo logo again, and some familiar Subbuteo pictures from other sets. The back of the box has a smaller, monochrome version of the picture on the front. It also has the address of Edilio Parodi snc in Genova, and tells us that the set is made in China. In smaller writing, it advises us that this is a "Hasbro 2002 © consumer product" and "Subbuteo marchio registrato concesso in licenza da Hasbro Consumer Product a: Edilio Parodi s.n.c." So now you know !! "Never mind all that", I hear you cry, "Get that cellophane off and tell us what's so special about this set." Okay, once the shrink wrap is discarded and the lid lifted, you'll find that the box is actually made of a thin card, with a green pitch graphic on the bottom section. There is no internal display insert, the two teams being individually boxed, and the other items provided in separate bags. These are the red logo balls as produced by Hasbro for their 2000-01 range. The patterning on these balls is quite deep, but luckily this doesn't seem to affect the roll of the ball. 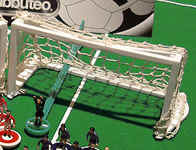 The goal is based on the classic Subbuteo World Cup version produced from 1973 until the late 1990s. However, the Parodi version has much thicker posts and crossbar, and is therefore going to take a bit more abuse than the original item. I think these were also the goals used in Zëugo sets. An A5 size booklet with rules in Italian, English, French, German and Spanish. The rules themselves are pretty much as they have been for most of the 1980s and 1990s. The pitch is a completely new material which looks and feels a bit like velvet. It lays nice and flat, and produces a good surface, almost like an Astropitch without the backing. It is far superior to any of the pitches found in Subbuteo sets of the last 20 years. Hurrah. The corners feature the Subbuteo logo and the hobby crest - another reminder of the glory years of the game. As mentioned above, the teams are individually boxed. This allows you to see the attractive new team boxes, which will hopefully be filling the shelves of Italian toy shops shortly. Once opened up, these boxes reveal two self assembly teams tucked into a central depression with places for the players set around it - as with Hasbro boxes. However, everything here is a bit different. The box inner is black, and the two spots for unbased players are now at the top. However, the biggest differences are with the playing pieces. The goalkeeper rods are also from Zëugo (the name was even printed on them in early sets), and these are therefore longer than the old Subbuteo version. However, they were produced in a nice Subbuteo green, rather than in Zëugo blue. Unlike Hasbro bases, these new teams are back on a two colour base. However, these are a completely new base design for "official" Subbuteo. Parodi have taken in a bit of know-how from the "professional" side of the table soccer market, where the Italians have been producing innovative designs for years. This knowledge has resulted in a base that has the wide flat bottom and low profile of a Hasbro base (enabling straight flicks and chip shots), but also has better spin and swerve capabilities than the aforementioned Hasbro players. This extra ability may not be as good as the old heavy and lightweight figures, but it does add a lot of fun back into playing. The top of the base clicks perfectly into the bottom in assembly, and the top edge is also slightly beveled, which I'm told is a good thing! (It probably helps with chips). I was struggling with my close control with these bases, but I expect I just need time to get used to them. The only teams seen so far in these new sets seem to be painted to the old No 4 (Vicenza in Italy), and No 490 (the ill-fated Fiorentina). 1. The bald player - Not all footballers have hair, so here's a figure with nothing up top, except for a nice pair of ears. 2. The Pony-tailed player. Great for Baggio, Seaman (if he ever decides to play outfield), and err... that's about it. Rather surprisingly, neither of my sides have any black players. These were included in Parodi's Zëugo teams, so I've no idea why there aren't any here. The other thing included in these first sets is a copy of Parodi's 2002 catalogue.